As we continue with our journey through a Culinary Class at One The Marsh in Kennebunkport, ME- after the gorgeous Potato and Leek Soup and the amazing roasted, boneless leg of Lamb stuffed with Mushroom Duxelle, I didn't think that anything comparable could possibly follow. However Chefs Jeffrey and Christine had one final piece of our dinner for us to learn to prepare- dessert! They had a perfect choice for it as well- what better to kick off the spring and summer months than something floral? 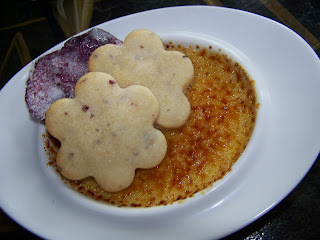 How about Rose Flower Water Creme Brulee? Oh my goodness! We started this dish by taking long smells of the Rose Flower Water. It's scent was beautifully delicate, but wholly of lovely roses. It had a very clear perfume-y vibe to it as well, making it clear that a little would go a long way. 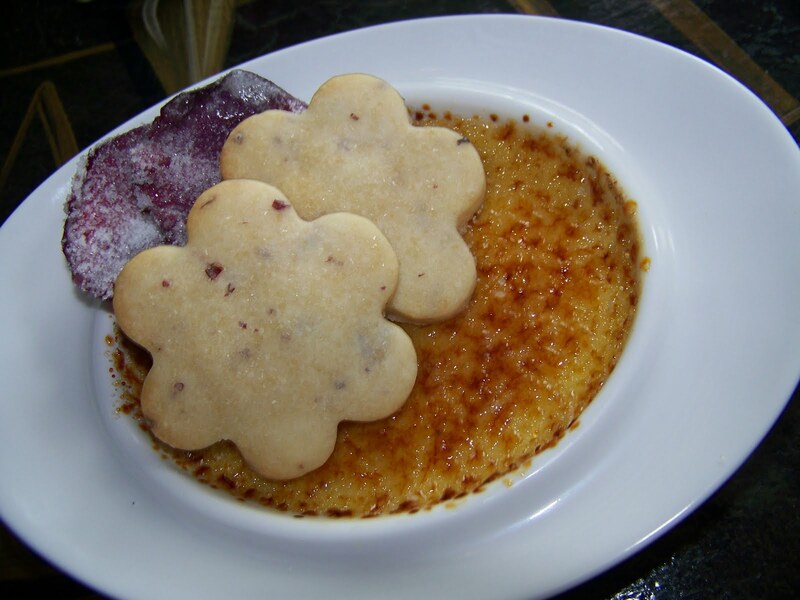 The chef's backed up this theory stating that too much of the Rose Flower Water could turn the creme brulee from a beautiful delicacy to into an experience similar to drinking perfume-not pleasant. 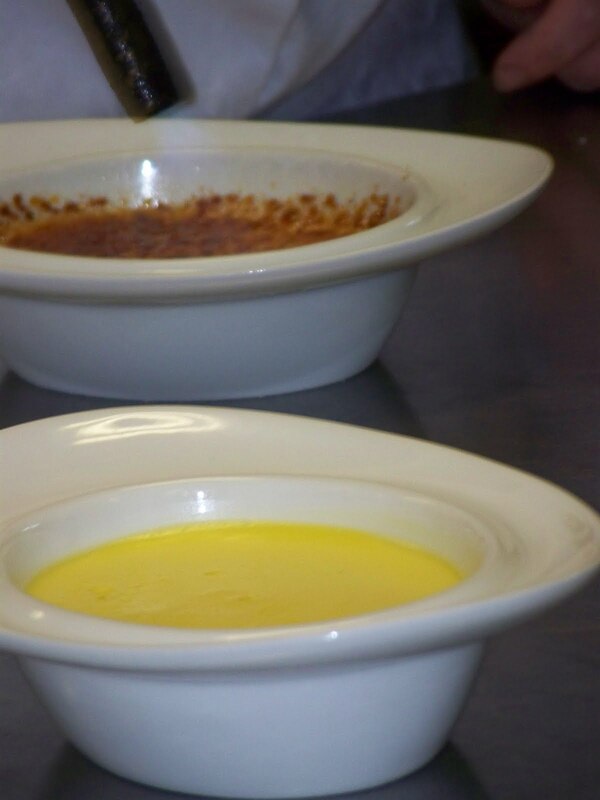 After we had each gotten a good feel for the flavor we were working with, Chef Chris took to the front to show us the nitty gritty of making creme brulee. She began by heating heavy cream, granulated sugar and the Rose Flower Water in a sauce pan until it boiled. While we waited for that, she showed us her favorite methods of separating eggs, and gave us each a chance to try it for ourselves. I have to give HUGE kudos to John here who has never separated an egg in his life, and tackled two that day! 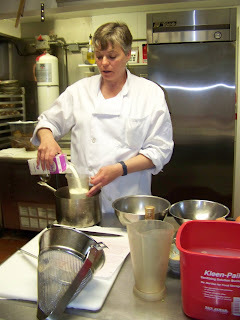 Once the cream mixture had boiled and the sugar dissolved, she began to add the cream very slowly to the egg yolks. She was careful to reinforce that tidbit of knowledge that adding a hot liquid too quickly to eggs will cook and scramble the eggs- not exactly the pudding that you might have imagined. So whisking continuously, Chef Chris slowly added about a cup of the cream to the eggs, and then when satisfied that they were fully tempered, she added the rest of the cream to the mix. 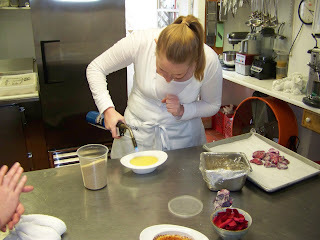 Though we skipped this step in our class (basically because Chef Chris is awesome and it wasn't needed :-) ) she instructed us that under normal circumstances we ought to strain the liquid pudding prior to baking. She then just divided it into several different bowls, placed them each in a pan filled just to the bowls half way point with water, covered them, and placed the pans into the oven. What was really wonderful to see here is that the baking time obviously varies. While they timed for a certain amount, they checked the bowls regularly to see if they had set. They noted well that cooking times, especially for these types of dishes can really vary, and stressed not to remove the pans from the oven too early. Once they were satisfied with the brulees, when they were set and there was no liquid spots remaining, they took them from the oven and placed them directly into the refrigerator to allow them to set fully. Luckily we had a delicious meal to enjoy while these set, so we went off to tackle that. 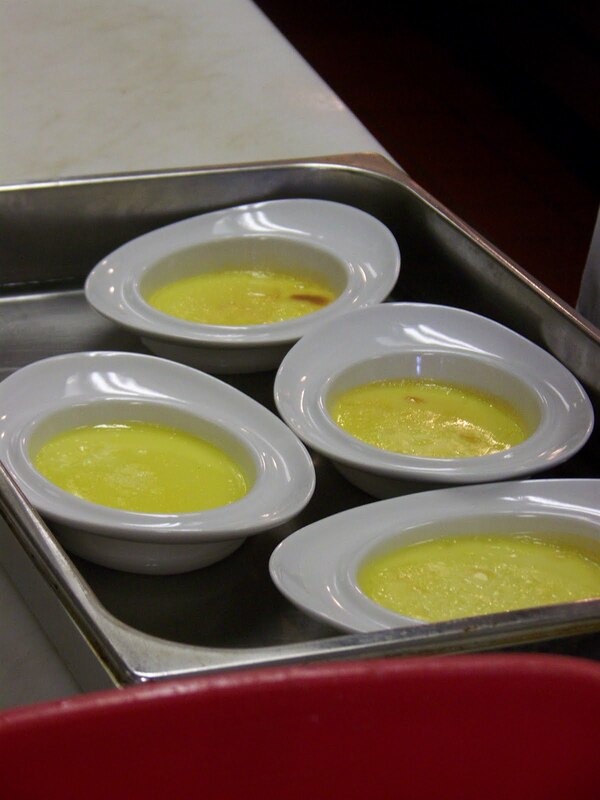 When it was time, the chefs called us back to the kitchen to assist (yeah right) with the brulee process. At this point pastry chef Michelle McEwen had arrived, so she took over the charge of guiding us through our fun with fire. The piece that I found the most interesting is that you really shouldn't use regular granulated sugar for brulee-ing, but rather should use raw sugar, or a Turbinado sugar as they used. As I recall, their thoughts on the matter were simply that granulated sugar creates more of a burned flavor than the others. So Chef Michelle had us each sprinkle the Turbinado sugar over our creme brulees, now fully set, and shake off the excess. She also noted that it was important to clean off any rim of the dish that you were using to be sure that you aren't making more of a mess to clean later. Then we each took a turn with the torch- a real welding torch- non of that sissy creme brulee style kitchen torches for On The Marsh. Nope-they handed us this very capable torch-you know the kind you can find at home depot. No big deal. Because of my extreme fear of fire- I was rather hesitant, but ended up totally loving the experience over all. The sugar didn't melt as quickly as I feared it would- so I had time to go over each piece and watch as the crystals melted together and turned a beautiful golden brown. When we were done with the first layer, Chef Michelle had us complete a second layer on each to ensure that the sugar crust was thick, and would give way to a satisfying crunch when we dug our spoons into it. 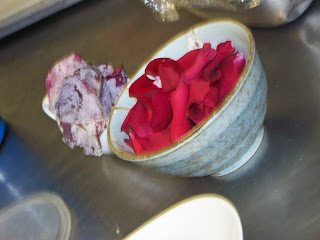 We headed back to the table after we were done with our fire play, and they served us the Creme Brulee's with two lovely shortbread cookies that Chef Michelle had enhanced with chopped rose leaves, and with two beautiful sugar crusted rose petals! I had thought of making sugar crusted something or other a few weeks back, and was astounded to learn how simple it really is. All that Chef Michelle had done was paint each petal with egg whites and then sprinkle granulated sugar over the top. Easy as pie! AND they looked beautiful-like snow covered rose petals. It was a gorgeous dessert. 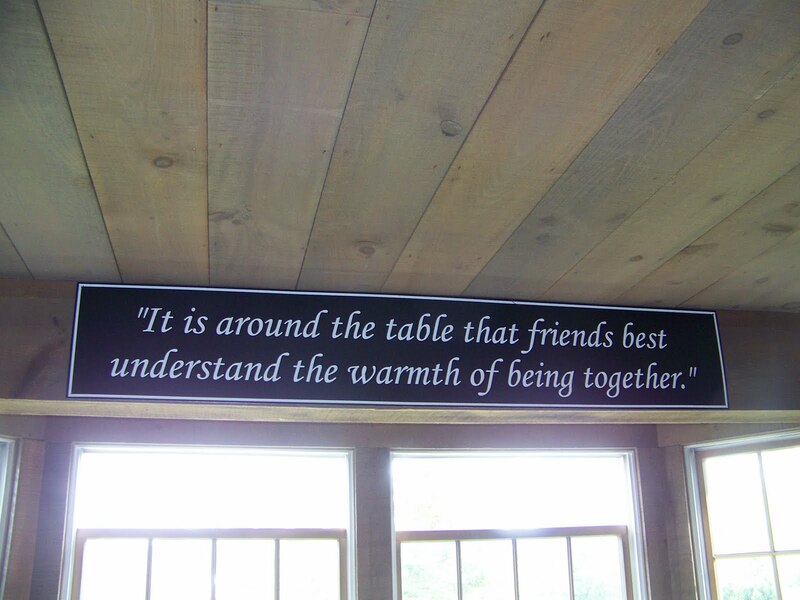 The Culinary Class at On The Marsh was one of the greatest experiences, not to mention surprises, that I have ever been a part of. Every person made you feel welcome and seemed to enjoy and appreciate every question that we had-no matter how silly. The conversation was easy and flowed, and I haven't learned so much in I don't know how long. I have to strongly recommend that if you are at all planning to be in the Kennebunkport, ME area- please see if there is available space in one of these classes. You will not regret it- or just go for dinner- I promise it will be incredible!